Oceanside wedding? Add these hair pins to your hair style on your big day on the beach. 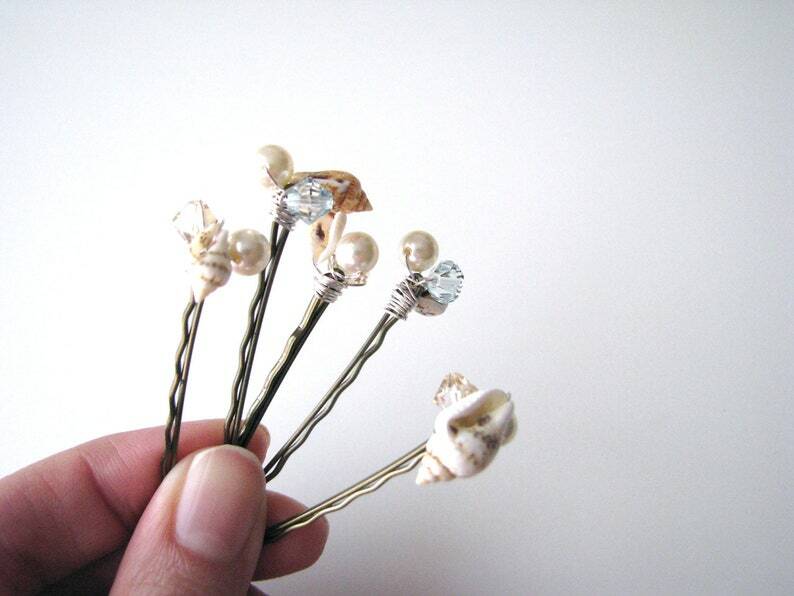 Set of 5 bobby hair pins with a cluster of tiny shells, pearl, and crystal beads with silver tone wire. The crystal bicone beads add sparkle to the pins. 3 pins come in the golden shadow color, 2 come in Lt azore, a very pale blue. Clusters are approx. 1/2" +/- across at the widest, depending on the size of the shell, and are attached to 2 inch bobby pins in your choice of color to coordinate with your hair. I have a variety of tiny shells, and will be similar but not exactly the same as those in the photo. Need a different color combo? Please ask about custom orders. If no choice is indicated during checkout, brown pins will be sent, as shown. NOTE: The shells are fragile. Do not pull on the shells to remove pins from hair, or they will break. Thank-you for shopping with Bella Mia Design!